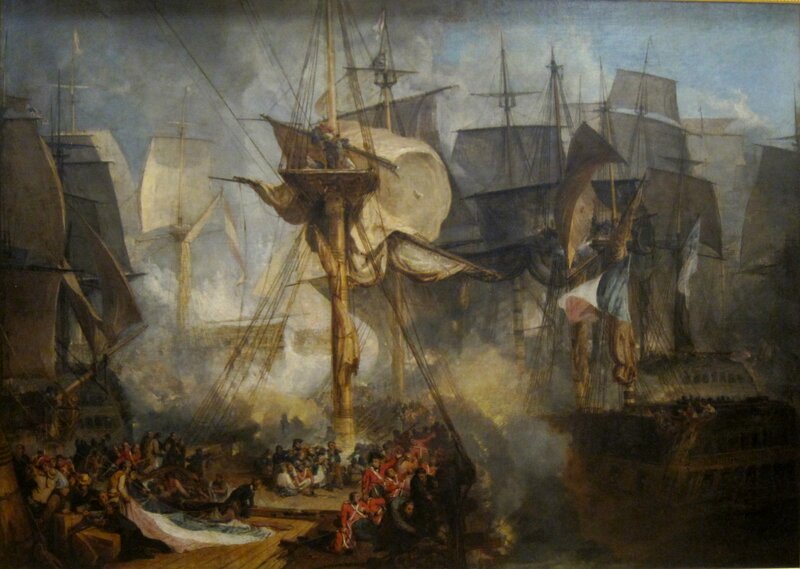 Admiral Horatio Nelson was determined to create a conclusive battle with the French and he would find one when he finally caught the escaping French naval forces. The French were desperate to find a way to break the British blockade of their ports and had come up with a drastic scheme to divert British attention and attack the island militarily. When Nelson found the French he took the abnormal step of not attempting to attack in straight lines, which would have been normal for the time. He broke his lines apart into thirds on purpose, allowing him to attack from more sides than a traditional attack. This was done because he knew that the French weren’t a good tactical navy and he did this to make it difficult for the French to coordinate a defense. the other side. The difference in the battle was that the British were very organized, by using flag signals from their flagship “Victory.” This battle would be won due to the training and readiness of the British troops as opposed to the inexperience of the French and Spanish. The 27 British ships would beat 33 French and Spanish ships off the coast of Spain(Cape Trafalgar). The British would destroy 2/3rds of the ships of the enemy while the British lost none in battle. The one major loss that the British took was Admiral Nelson himself, who was shot in the spine during the battle and die of his wounds. This win gave the British full control of the seas around Europe and made it impossible for any other country to trade without their consent. Admiral Nelson became 1 of Britain’s greatest war heroes for the battle, and the battle would become among the most well-known battles in history (taught everywhere). Trafalgar Square in London was named in honor of his victory and is still one of the most well-known tourist attractions in the world. Despite the fact that this is such a well-known naval battle, Nelsons unorthodox tactics were seldom emulated by later generations. This probably is due to the fact that people don’t go to war with poorly trained troops anymore, but it is interesting that such an important battle wouldn’t have strategic legacy. As important as the battle is, it had very little impact on the war itself since the French never had control of the sea before this. Napoleon would refuse to let this loss be known in France and would cover up the story in the media, so his people wouldn’t learn. On the flip side, both the French and the Spanish claimed that they had won for propaganda effect it would have.